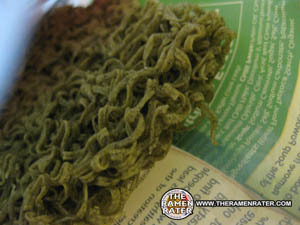 So today here’s review #98 – the weird GreeNoodle… These noodles contain some kind of weird ingredient called moroheiya. “Moroheiya is a super vegetable that is more nutritious than spinach, carrots, or borccoli in most aspects” is written on the back and cite as a quote by the ‘Japanese Ministry.’ although which Ministry that would be is unclear to me. Yup – they’re green alright! 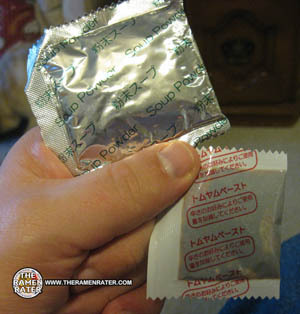 Seasoning powder and another packet who content is not evident unless you read the outer packaging (unless you can read Japanese of course). 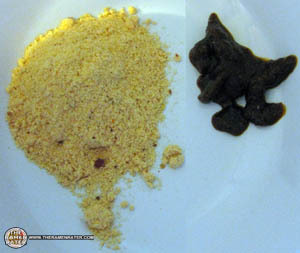 Powder and chili paste: say hi to hot pain! Okay so health aspects aside, I did not like it (click image to enlarge). They had a strange flavor. I can’t describe it. 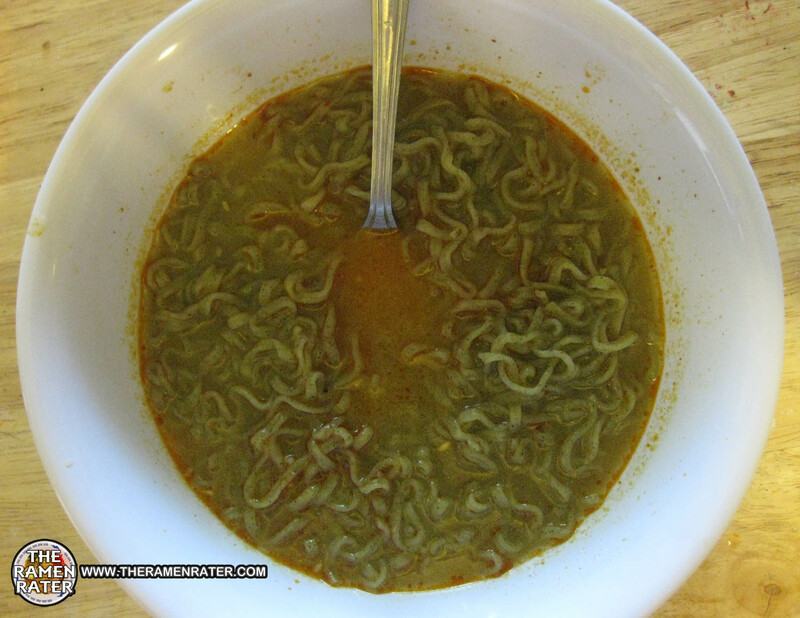 The actual noodles tasted artificially flavored – maybe the moroheiya? I dunno. These guys are very much of the new information age and have their website prominently shown on the back – www.greenoodle.com. This one really did not appeal to me at all. I’ll admit, a very interesting idea trying to bring a healthy item into the instant noodle world, but I think the execution could be better – perhaps if they emulated Indomie’s style of Mie Goreng! That’d really cover up the flavor and be a competitive idea… But for now, I give it 0.5 out of 5.0 stars. Not to my liking. Get it here. You didn’t talk about the elasticity of the noodles at all. Are you SURE you know how to review ramen? You only review flavors so you may as well be sucking down the tom yum goop and chilli pepper packet. Also, if you review so much ramen, shouldn’t you KNOW that the goop is just the soup base? Listen crankypants, I’m assuming you like these noodles and I’m glad you do. But honestly when I give a 0.5 out of 5.0 stars rating it is because I feel they taste like crap. It’s my opinion. So it is also my opinion you like eating something that tastes like crap. You might think the varieties I enjoy taste like crap, henceforth I shall be eating crap. If you want your favorite noodles reviewed in a way that you agree with, all I can say is review them yourself on your own blog. I recommend it – it is a lot of fun and you get to meet jolly, happy fellow noodle people! I agree. These noodles do taste like crap. 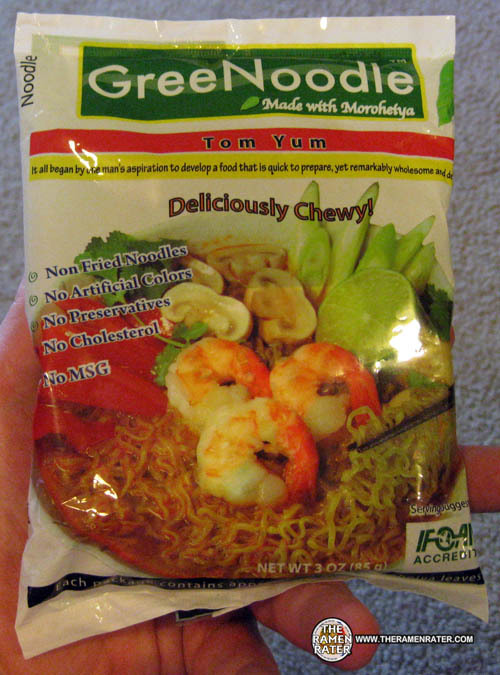 I haven’t tried this flavor specifically, but Greenoodle makes another Yakisoba flavor that I thought was pretty good. If you ever get a chance, you should try it! If I see them I’ll definitely give ’em a try! Thanks! i second Amanda’s opinion! greenoodle yakisoba is pretty tastey! I got some – I got tthe Yakisoba, Miso and Shitake and will try them sooner or later. Hmmmm. I liked the coconut flavor- thought this was great. Hot, with the extra chili sauce. I’d give it a 4 and will definitely buy again. To each, her own!